$1.10 - $1.25 Per Sq. Ft. NNN / Mo. 400 - 1,440 Sq. Ft.
$0.54 per Sq. Ft. / Mo. 283 Lalo is a two-story building comprised of office and warehouse units. There is a fenced yard behind the property where additional warehouse spaces are located. Lalo Place is centrally located in Kahului, Maui, Hawaii. 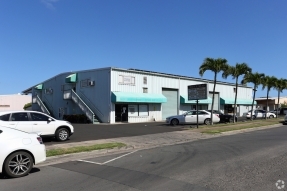 Minutes away from the airport and Kahului Harbor, the property is also near connecting roadways to the South and West shores of the island.